Here in Melbourne, Australia, the tech scene is booming! The Martec put together a great summary of Melbourne startups that began life right here in the world's most liveable city. Comparison shopping engines, otherwise known as shopping aggregators, are considered by some as the darlings of the internet era, and for good reason. With the profits of some aggregators, such as hotels.com and booking.com, exceeding $6 billion annually, it’s fair to say that this industry is one to watch. Shopping cart abandonment – who is really to blame? It’s been described as the bane of the online retail industry, and for good reason: shopping cart abandonment costs retailers over $USD4 trillion per year. And to make matters worse, it doesn’t have to be this way – 63% of this could be recovered, experts say, if only merchants were a little more savvy. Social buy buttons are invading the internet – but are they working? Social media is already a premiere destination for many of our daily needs - whether it be to socialise, read, or job search. So it makes sense that it will soon be a premiere retail destination as well. And that’s exactly what all of the big platforms, including Facebook, Twitter, and Pinterest are hoping to do with the recent introduction of ‘Buy buttons.’ Heralded as ‘the next big thing’ in ecommerce, buy buttons enable users to purchase items en masse, without having to ever leave the comfort of the app they’re using. But are the buy buttons (also known as click-to-buy), really as great an idea as they seem? Fillr, creator of the world's most accurate, fastest and secure autofill technology, today announces a $5 million Series A fundraising round from a consortium of international investors including SoftBank China Capital, Southern Cross Venture Partners and Reinventure. SoftBank China, the single largest investor in e-commerce giant Alibaba, joins forces with current investors, Constant Innovation, the early stage venture fund launched by the founders of carsales.com, including Chairman Wal Pisciotta and CEO Greg Roebuck. Want your customers to checkout faster on mobile? 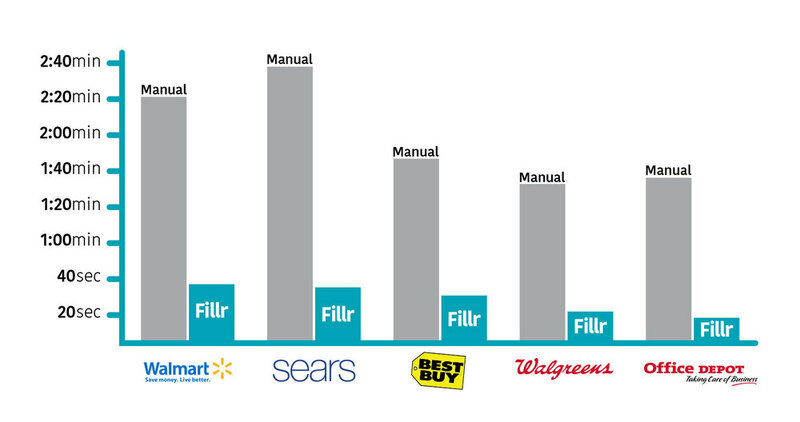 Here are 5 reasons why you need Fillr Autofill in your app! More people convert with Fillr. Fillr has developed 'autofill as a service' that seamlessly integrates into your app, enabling your customers to transact faster, boosting your conversions and revenue. We've spent over two years (and lots of hard-earned $) building the world's best autofill... So you don't have to. A Melbourne-based start-up that makes filling in online forms easier has raised $5 million from major international venture capitalists. Dolphin browser, commonly regarded as one of the Top Android Browsers by popular sites such as Android Central, now includes Fillr's intelligent autofill technology. Not only more accurate than Google's and Apple's autofill products, Fillr is also faster and smarter. We’re even faster and now fill passwords! November 2015 marked a milestone for one of our partners, Browser 4G, an extremely fast and user-friendly browser for Android devices (to view it in the Google Play Store click here). The team at Zoomob launched Browser 4G 12 months ago and have crossed one million downloads in Play Store in a much shorter time than even they expected (with an average 4-star rating from 13,000+ users). Designing Fillr has been an exercise in thorough planning and designing with data. With three months under our belt, it’s a great time to review how we got here and more specifically how the product and design team have been integral in the journey. "This is a new app I’ve come across and love- it takes the hassle out of filling out online forms on your mobile by automatically filling in saved personal information. HUGE time-saver" - Rocy Jacenko to Elle.